The LGBT community in Israel is taking to the streets today to protest the country’s surrogacy law. Israeli PM Benjamin Netanyahu has come under fire for his handling of a bill to legalise surrogacy in the Israeli Parliament. Although the bill extended surrogacy rights to women who cannot naturally conceive, Netanyahu blocked an amendment from a Likud MK that would have extended the same right to gay couples and single men. The move has led to a tidal wave of fury against the state and Netanyahu personally, with massive protests taking place in Jerusalem, Tel Aviv, Haifa and Karmiel. 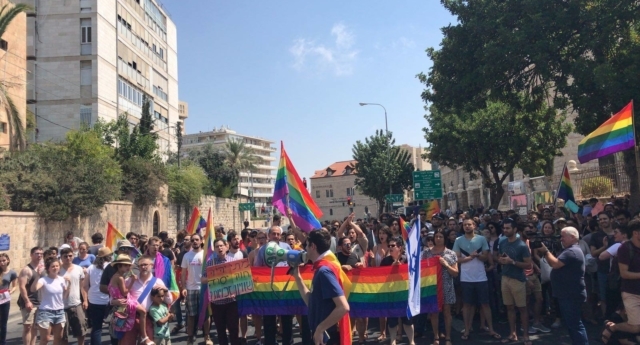 According to the Jerusalem Post, protesters gathered outside Netanyahu’s official residence in Jerusalem, chanting slogans accusing him of being a homophobe. Sunday is a working day in Israel, but it was reported earlier this week that many of the country’s largest businesses had notified employees that they would not face action for taking part in a planned general strike action to protest the law. In Tel Aviv, protesters shut down the Ayalon Highway – one of the main thoroughfares in the city. Israel’s Airports Authority has warned that flights to the country are likely to be delayed as a result of the strike. Meanwhile some companies have vowed to help fund surrogacy privately. According to the Times of Israel, Microsoft’s Israeli R&D Center said: “The current text of the surrogacy law excludes the LGBT community and denies them the basic human right to establish a family. Netanyahu had originally supported the gay surrogacy amendment, but voted to block it – allegedly after pressure from ultra-Orthadox lawmakers. The PM has spoken out to claim he was trying to ensure the main legislation would gather enough votes to pass, and suggested he would support separate legislation to expand the practice. Attitudes in some parts of the country are much more conservative.